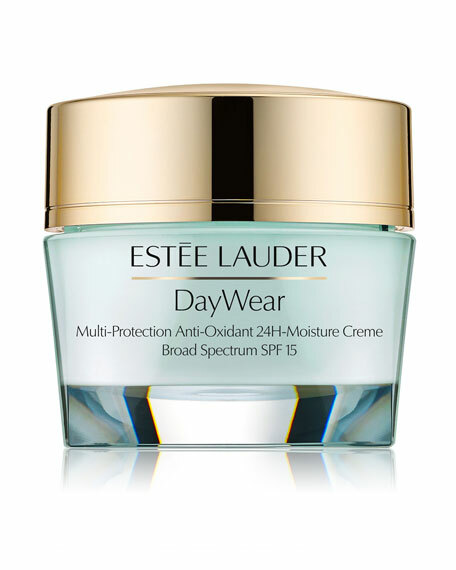 Estee Lauder DayWear Advanced Multi-Protection Anti-Oxidant Creme SPF 15, Normal/Combination, 1.7 oz. Estee LauderDayWear Advanced Multi-Protection Anti-Oxidant Creme SPF 15, Normal/Combination, 1.7 oz. This high-performance moisturizer defends against signs of premature agingand diminishes their appearancewith the most effective anti-oxidant power ever*. So hydrating, it infuses skin with an intense surge of moisture that lasts24 hours. DayWear includes our proven Super Anti-Oxidant Complex and sunscreen. It reduces the first signs of aging, like dullness and fine, dry lines. Refreshes skin with lasting hydration. *In vitro testing, comparing Super Anti-Oxidant Complex with widely used anti-oxidants such as Alpha-lipoic acid, Kinetin, Vitamins C and E, Coenzyme Q10 and Idebenone.